So last year while trying to cope with my postpartum depression, raising a tiny human and dealing with baby daddy drama from ninth circle of hell... I ended up gaining about 25 pounds. By the time November came around, I was weighing as much as I did while I was 6 months pregnant. I had to tighten up the reigns on my weight because I could not afford a whole new wardrobe. I picked the worst time of the year, but the week before Christmas I decided to start the ketogenic diet. So far I'm down 27 pounds and counting. I love pasta, it's such an easy dinner especially when you're a single mom. 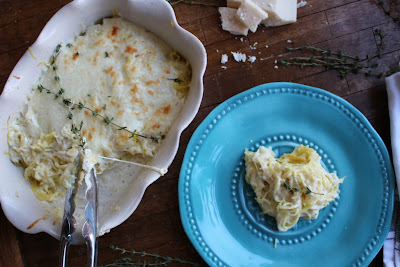 I've been playing around with making keto-friendly substitutes to my reliable pasta standbys, which brings me to this spaghetti squash Alfredo recipe. The recipe is done in 20 minutes! I posted a picture of it on my Instagram and had an overwhelming amount of people asking for the recipe so, here it is. Cut spaghetti squash in half and remove all the seeds. Drizzle the inside of the squash with olive oil and rub to cover the inside of the squash. Sprinkle with salt and pepper. Place squash halves, cut sides down, in an 8x8 casserole dish; add the 1/4 cup water. Microwave, covered, on high for 15 minutes. Or until tender. While the squash is in the microwave, start working on the Alfredo sauce. In a medium saucepan over medium heat, place the cream cheese and butter. Once melted, slowly incorporate the heavy cream and 1/2 cup of Parmesan cheese. Once well combined, whisk in the garlic, pepper and nutmeg. Set to low heat and whisk occasionally. Once your spaghetti squash is tender, cool slightly and separate strands of squash with a fork. Spread the strands evenly onto the same 8x8 dish you cooked it in. Evenly pour the Alfredo sauce over the top of the squash stands. Top with the mozzarella cheese and 1/4 cup of Parmesan cheese and place uncovered in the oven under broil until cheese is slightly browned and bubbly.